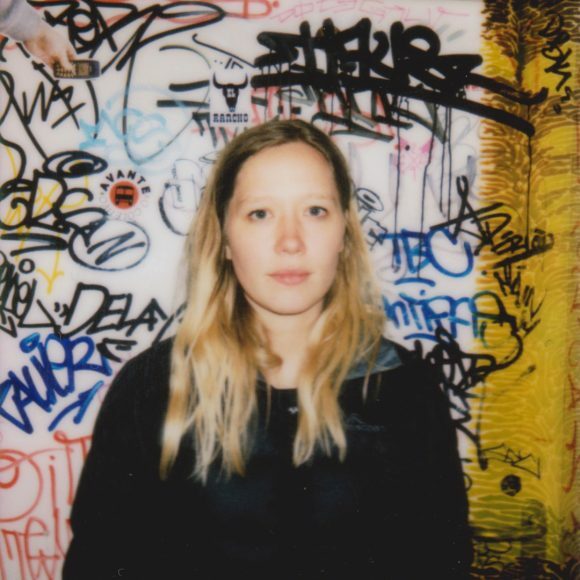 The wonderful Julia Jacklin finally made it back to Munich! We talked to her about songwriting, her first memories that she connects with music and a lot more. So this is your first headlining tour in Europe. How’s it going so far? Really good! It’s been really nice. Pretty relaxed, we’re trying out new songs. Have you had a favourite city so far? We love your album cover. Can you tell us why you picked that photo in particular? I was desperate for an album cover cause we had a deadline. I knew that this house which we shot a music video in was visually really cool, so I just got my friends and told them to take a million photos cause I was sure one would fit. I think this was the last photo we took, actually. I’m really happy with it! We didn’t have the ball in it initially, but then I thought it was lacking a pop of colour. I wanted it to be a bit brighter. And the woman of the house was like ‘I have a blue exercise ball’, so we did that. You write really beautiful and deep lyrics. What is your favourite line of one of your songs? Probably…hm, probably from ‘Lead Light’. What do you think is the hardest part about being a young artist in the music industry? I don’t know…just constantly worrying that you’re gonna make a mistake that will impact the rest of your life? (laughs) But I think that’s just being a young person anywhere. It’s just in terms of having a bit of a profile, having my birth name being out there, people putting expectations and ideas on who I am based on my music and my photos or something…just having to make sure that I don’t do anything or say anything or make anything that compromises or ruins that. Cause I think it can be hard to turn that around. What’s your first memory that you connect with music? I wrote this song with my sister when I was seven, cause this old lady at the road was sick. We used to visit her and look after her dog. So we wrote her a song…I don’t think it was really good. But we sang it to her, and I think it made her happy. Imagine it’s the future and you’ve got kids. Which concert would you pick for them to be the first one to come along with you? That’s really tough. How old are the kids? Proper age for a first show. Like… let’s say teenagers. What’s your favourite record of all times? That would be…oh, that’s hard. I’d go with ‘Extraordinary Machine’ by Fiona Apple, ‘Death of a Ladies’ Man’ by Leonard Cohen and right now… ‘Puberty 2’ by Mitski. Can you name one song that makes you want to dance immediately? Wow, that’s so tough. … I can only think of the really obvious one. ‘Let’s Dance’ by David Bowie. What was the best thing that has happened to you ever since you’ve started making music? Oh, there’s been a lot. But the best thing… I’d go with playing at Laneway Festival in Australia. I grew up going to this festival and I would have never imagined to play on one of those stages in my life, so that was extremely cool. I was really happy for my eighteen year old self who went to this festival, looking at all of those stages, going “Oh my god, those people are amazing! I’ll never be like that!” And then standing on this stage felt really validating and wonderful.